My favorite painting from the gallery is a portrait of Ben Jonson. A playwright and poet of the Jacobean era, Jonson received some distinction with the works Bartholomew Fair and The Alchemist, both of which I have not read – and for good reason. Unlike his contemporary, Shakespeare, Jonson has completely fallen off the map, having none of the distinction and prestige of his fellow bard. Jonson, as it were, is not “canonical.” In any case, Jonson’s poor rep didn’t prevent me from enjoying his portrait. Indeed, an interesting point about portraiture is that there seems to be a sort of discrepancy between the the artist and the subject. Take for instance the portrait of Shakespeare. Our interest lies with the subject, Shakespeare, and not the artist. Conversely, in Van Gogh’s Portrait of Dr. Gachet we are interested in the fact that the painting’s author is Van Gogh, and less so by the fact that the painted figure was someone called Gachet. And of course other times, the interest is mutual – Da Vinci’s Mona Lisa. Its interesting to note how the discrepancy lessens as you go further through the timelines in the gallery. The Tudor, Stuart, and Jacobean rooms are very much indicative of the British brand of class system and ideology. But as you reached the portraiture of the early 20th century, you find friends drawing each other (i.e. Bloomsbury group). The artist who painted Ben Jonson’s portrait is Abraham van Blyenberch, a flemish artist of whom I know little about and care even less. Yet I found it to be one of the most original portraits in the gallery, rivaling that of the ones of Tennyson and Sir John Fieldings. Instead of the traditional rigidness we’ve come to expect from the Renaissance, Blyenberch’s Jonson is refreshingly relaxed. He looks slightly bemused, his head tilted just enough so that it conveys a sense of contentedness and ease. Even so, the portrait still relates to the viewer an august demeanor, probably due to the variations of bronze in the background, hair, and face. When I first looked at the work, I immediately thought of Rembrandt; Jonson’s beady, penetrating eyes echoes that of the psychic dimension of the Dutch master’s self portraits. Although Rembrandt would create his most famous pieces almost a generation later, the style we associate with that region seems to be diminutively intuited by Blyenberch. 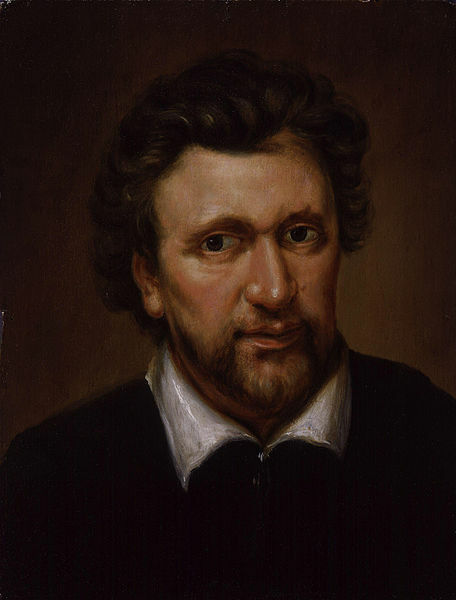 Through this portrait of Jonson, we are able to look beyond the British stiff upper lip.